First Line: If I have learned anything in this long life of mine, it is this: In love we find out who we want to be, in war we find out who we are. It's 1939. In the small French village of Carriveau, Vianne Mauriac sends her husband off to war, never thinking that the Nazis will invade her country-- but they do. Vianne's father sends her eighteen-year-old sister Isabelle to Carriveau to get the troublesome girl out of Paris. Isabelle wants to live a life that matters, and she thinks her older sister too cautious, too afraid. Isabelle joins the Resistance, constantly risking her life to save others, while Vianne stays at home with her daughter, doing everything she can to ensure that her loved ones survive the Nazi occupation. 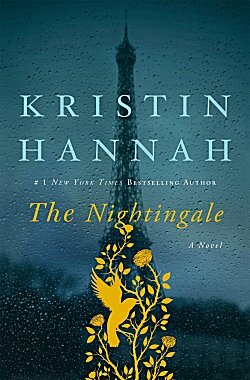 When I first began reading The Nightingale, I almost gave up. The headstrong Isabelle is just the sort of character that makes my blood boil. Poor little Isabelle! Your daddy doesn't love you the way you want him to. Your sister's a stick in the mud who doesn't pay enough attention to you. It's all about you, you, you, and you should be able to say and do anything you like regardless of the danger you put everyone else in. Boo hoo hoo. But... something told me that this irritating young girl would undergo a sea change, and she certainly does. Hannah plays one sister off the other beautifully in this pitch-perfect setting. Compared to the beautiful, willful Isabelle, Vianne does seem dowdy and quiet, a scared little mouse. But it's easy to flip your hair, pout, and go out to do something stupid when you don't have to worry about the well-being of your child and your husband. When you are forced to live with a Nazi officer under your roof. There is a mystery in the pages of The Nightingale. Almost all the action occurs in France during the years 1939 to 1946, but there is an occasional chapter from 1995. One of the sisters is going to an important gathering-- but which sister? When the sister's identity is finally revealed, I was not surprised, but I was gratified. However, this identity puzzle is nowhere close to being the heart of this powerful novel. Through the trials of these two sisters, the author shows us the true meaning of love, of survival, and of courage. This is a powerful, visceral story that can leave you feeling emotionally drained, and although I had a bit of a contretemps with Isabelle at the very beginning, I loved it. Powerful first line, I need to get this active on the reserve list! Yes, that first line drew me right into the story. Oh, this does sound good, Cathy! I really like the sound of the mix of history and mystery, too. I don't think I'd like Isabelle, either, but still, it sounds like a fine read. It is a fine read, and Isabelle does grow up (which meant that she stopped working my nerves)! I loved this book. So courageous and so very emotional. I felt much the same as you about Isabel through the first half of the book--I think the back and forth narrative really works to show how each sister evolves and overcomes her liabilities and finds her strengths. I really enjoyed the book, but I almost thought it should have been called The Nightingales, as both really deserved the title. I think they decided to keep it singular in order to see if they could mislead us as to the identity of the woman speaking in 1995.